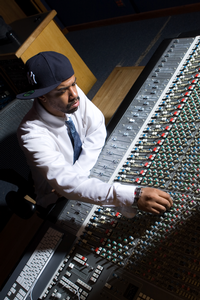 After building a production and engineering discography of collaborations including indie artist heavyweights billy woods, Cannibal Ox, Reks, Blockhead, Roc Marciano, Open Mike Eagle, Bad Rabbits, and Angi3, Paul "Willie Green" Womack has taken the reins on projects from Japan to the Czech Republic and beyond. His recent successes have included billy woods’ critically acclaimed "History Will Absolve Me" and "Dour Candy", as well as projects from PremRock, Corina Corina, Mura, and his own solo album "We Live In The Future." The exposure, touring, and subsequent projects with an expanding client base helped land him a spot on Kevin Nottingham’s list of "Top Producers of 2012." With an ear and dedication for impeccable progressive music, Willie Green has established himself as one of the top record men in independent urban music.